SEWP V is a multi-award Government-Wide Acquisition Contract (GWAC) vehicle focused on commercial IT products and product based services. Through SEWP V, Wildflower offers IT products including tablets, desktops, and servers; IT peripherals; network equipment; storage systems; security tools; software products; cloud based services; telecommunications; Health IT; sensors; video conferencing systems and other IT and Audio-Visual products. Product-based services such as installation, training, maintenance, and warranty are also offered. 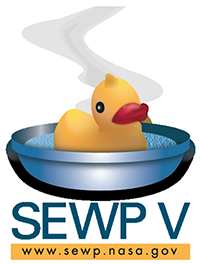 Contact us to help you with all your SEWP V IT needs. Contact us for your NASA SEWP V technology needs. We have been supplying the best technology to the best Federal Government customers for 3 decades. We can help you today.